Our 72" Diameter Round Folding Wood Table has a standing height of 30". It can be easily moved around and folded when not in use. This round wooden table with a metal edge is a great addition to your rental business or catering facilities. It is also ideal for home use and can be used for indoor and outdoor events. The top is made of 3/4" thick clear-faced plywood made from birch that's sanded smooth, without any voids or patches visible. Our table tops are also sealed on both sides with a protective polyurethane finish. This table's edging is made from aluminum that's been crimped at high pressure to keep it locked on to its side permanently, and the legs are composed of 1" diameter silver-colored, powder-coated steel tubing, with cold-rolled 16-gauge thickness. 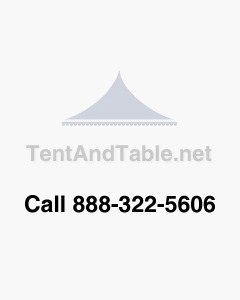 These folding tables for sale make great wedding, banquet, picnic, or restaurant tables and are easy to stack and store. Please note: These tables do not fold in the center, only the legs fold in for additional commercial durability.